This last Saturday the wife and I took advantage of the almost warmth and decided to just about murder our inherited overgrown rose bushes. That work being done and cleanup being on deck, I took it upon myself to defend our yard against the stray cats which rule our neighborhood by converting our (also inherited) pile of bricks into a little wall that would cover a height from the ground just up to the bottom of the chain link fence we share with our neighbor to the east. We’ll call him Paul because that’s what he told me his name was. I knew exactly where the cats were getting in under the fence because there’s the beginning of a convenience path dug into the grass there and anyway one evening we were out back eating dinner on the porch and the little jerks tried entering by the same access point a few times before sensing our presence and deciding better of it each time. So that spot was a priority, but then upon inspection I realized that probably 75% the length of the fence did not meet the ground to such a degree that a cat or cat-sized varmint could probably slip under it wherever it pleased. It’s a good thing our brick pile was so numerous and otherwise useless. These are those big flat bricks like you’d use for a patio or, I guess, a garden wall. Like the ones they break in karate exhibitions. I laid these all along the fence on their long sides, flat faces leaning on either the fence itself or on a few stakes I planted so I don’t completely bow out the chain link. I was pretty proud of my accomplishment. I know a cat, being a cat, is going to find a way into my yard if that where it really wants to be. The point of this operation was not total containment, but disruption. That night I turned on the floodlights back there (bulbs of which we’d replaced that day; they had never worked for us before) and I saw a possum sluggishly crossing the yard way at the back, as if the lights had awakened him. I’d never seen a possum back there before, and I took it as a sign that things were indeed disrupted. Yesterday, Easter, I looked back there in the morning and the bricks still stood. Easter came and went. This morning once we had daylight I checked again and eight of the bricks had been toppled, all around the notorious access point. Either cats, Paul, or the wind had kicked them over and opened us up to invasion. So this morning I went back out and installed a temporary fix by stacking what bricks had been toppled on top of each other in front of the access point, rather than leaning them. 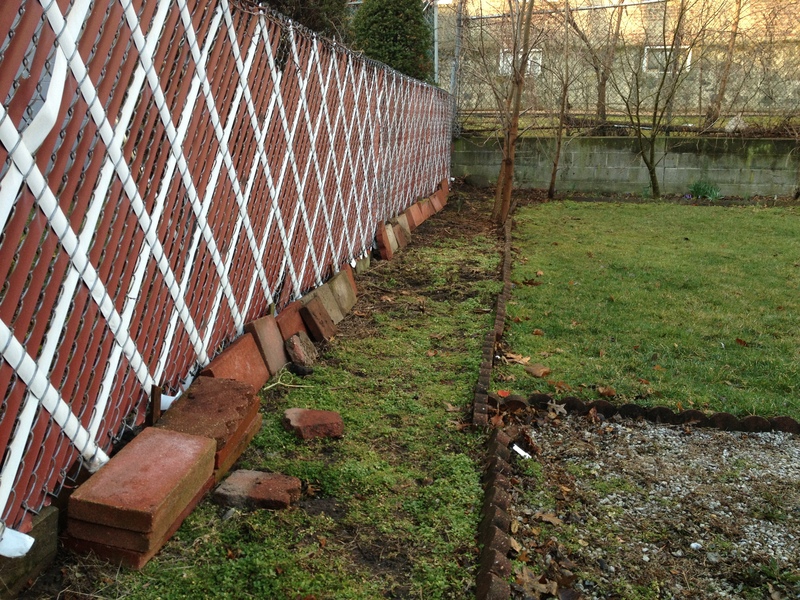 If the cats can knock over a stack of bricks than they deserve to poop in my yard and I guess I am powerless to stop them, at least until we put up some chicken wire.